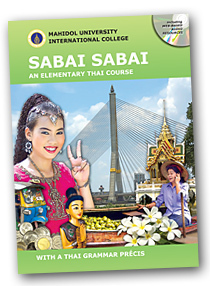 The Sabai Sabai Thai Textbook projectwas initiated in 2004 in order to provide a sound framework and practical class materials for international students at Mahidol University International Collegewho wanted to learn Thai. Each lesson consists of a listening and speaking part and a reading and writing part. Lessons one to five use a phonetic transcription system designed to help students quickly master the fundamentals of Thai phonology and facilitate language acquisition. The appendix section at the end of the book provides the texts of all the listening activities contained in the book, a précis of Thai grammar, a phonetic glossary, a Thai glossary, various maps of Thailand, and the Thai alphabet. The corresponding sound files can be downloaded from this website, as can additional writing components, for practicing writing Thai letters.